This well know brand are legendary on the West Coast for their strength of construction and sea handling abilities. This example was built by Scott Fury and launched in 2000 and has had only two owners since. The 250Hp Evinrude E-Tec was installed in 2006 and pushes this craft to 35 knots. There is loads of deck space for fishing or entertaining and the bow area has a custom awning for overnighting at the islands. If you are looking for a serious off-shore vessel for island hopping or annual North West fishing trips then this Fury 26' may suit you perfectly. The Duralite tandem axle Aluminium trailer was purchased new in 2016, has a 3500kg capacity and is available to be purchased seperately with Victorian registration. Bow camping awning, console cover and seat cover. Raymarine VHF, 12v Lighting, Raymarine E Series GPS and Echo Sounder. 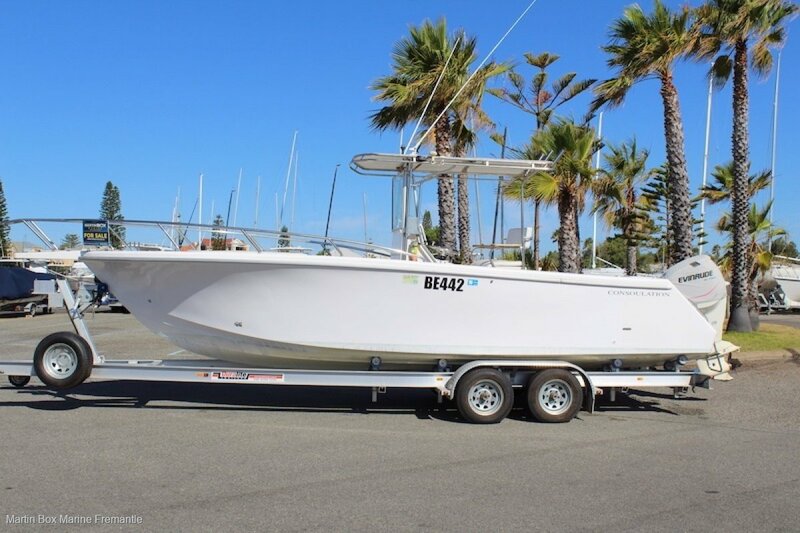 If you are looking for a serious off-shore vessel for island hopping or annual North West fishing trips then this Fury 26' may suit you perfectly.